As many as 22 million people could be at risk. A military coalition led by Saudi Arabian and United Arab Emirates forces, with vital guidance and supplies provided by the United States, has launched the largest assault of Yemen's war, with an attack on the massive port city of Hodeidah. As many as 22 million people – three-quarters of Yemen’s population – could be at risk of losing access to necessary food and medicines they receive through the port, amid a worsening humanitarian crisis on the verge of famine that the U.N. has described as the world’s most dire. "Any attack on or significant, long-term disruption of operations of the port will have catastrophic consequences for the people of Yemen," Frank McManus, the International Rescue Committee's country director in Yemen, told ABC News. 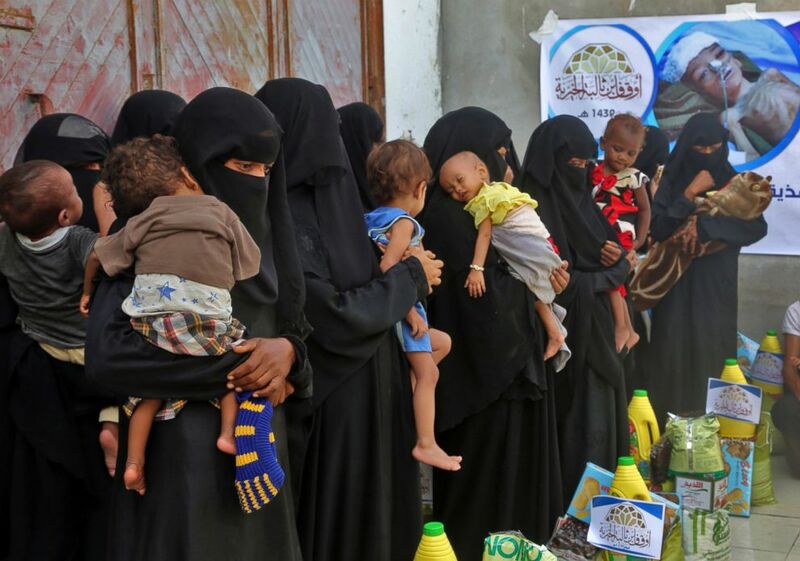 (ABdo Hyder/AFP/Getty Images, FILE) Yemeni women and children wait during food distribution in Hodeida, Yemen, May 30, 2018. 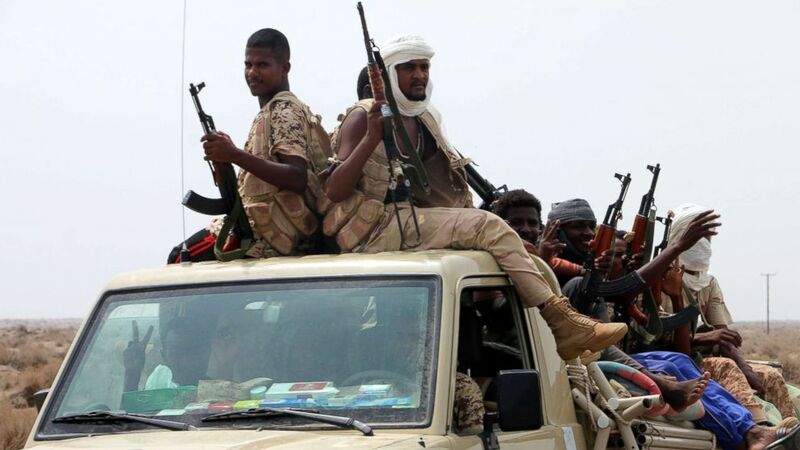 Saudi Arabian warplanes and warships began pounding the fortifications of the Iranian-supplied Houthi rebels this morning, to support ground operation “Golden Victory” led by Yemeni troops massed south of the port of Hodeidah, witnesses told Reuters. 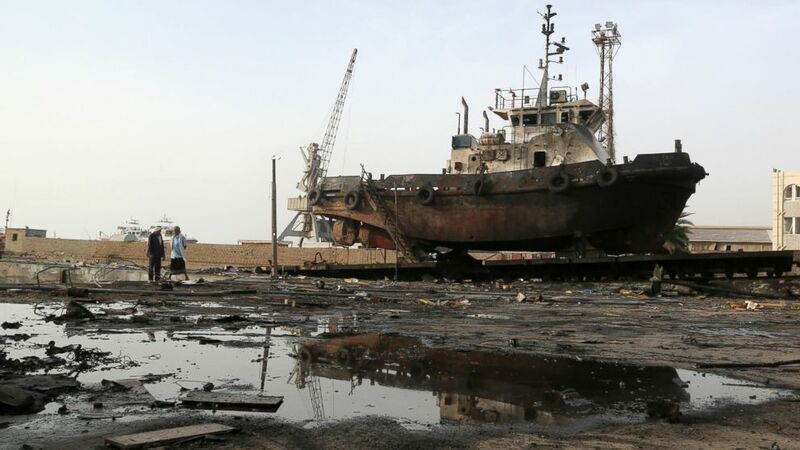 (Abdo Hyder/AFP/Getty Images, FILE) Workers inspect damages at the site of an air strike on the maintenance hub at the Hodeidah port, May 27, 2018. "We condemn to the fullest extent the launch of an attack by the Saudi and Emirati-led coalition on Yemen's port city of Hodeidah," he said. Human rights groups say airstrikes carried out by the Saudi-led coalition have killed and wounded thousands of civilians, often in indiscriminate attacks. 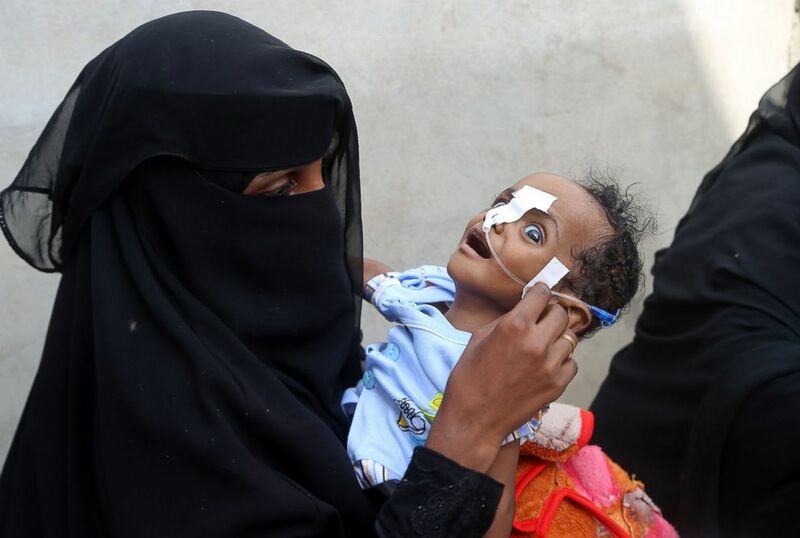 (Abdo Hyder/AFP/Getty Images, FILE) A Yemeni woman carries a malnourished child as she waits during food distribution in Hodeida, Yemen, May 30, 2018. Wednesday's military operations mark the first time the Arab states have launched such a wide scale attack since joining the war three years ago against the Iran-backed Houthi rebels, who control the capital Sanaa and most of the populated areas of northern Yemen. (Najeeb Almahboobi/EPA-EFE/REX/Shutterstock) Sudanese forces fighting alongside the Saudi-led coalition in Yemen gather near the outskirts of the western port city of Hodeidah, Yemen, June 12, 2018. 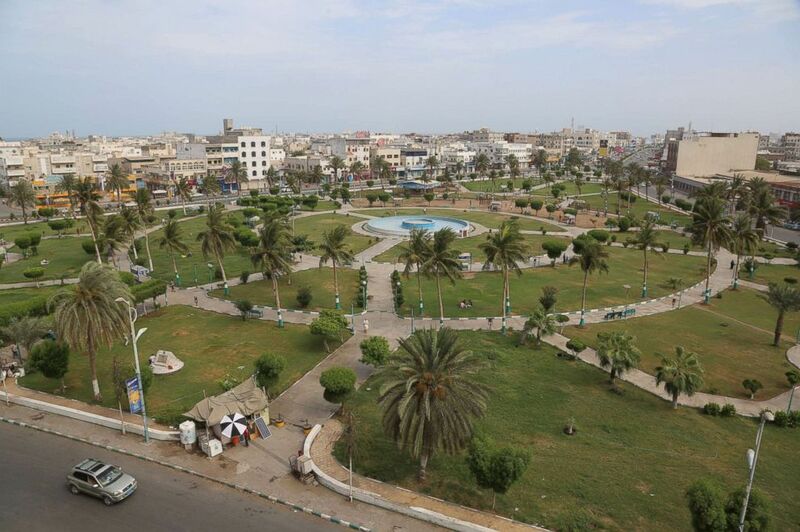 "Hodeidah is absolutely essential to the preserving of life," the United Nation's emergency relief coordinator, Mark Lowcock, said this week. "If for any periods Hodeidah were not to operate effectively, the consequences, in humanitarian terms, would be catastrophic." 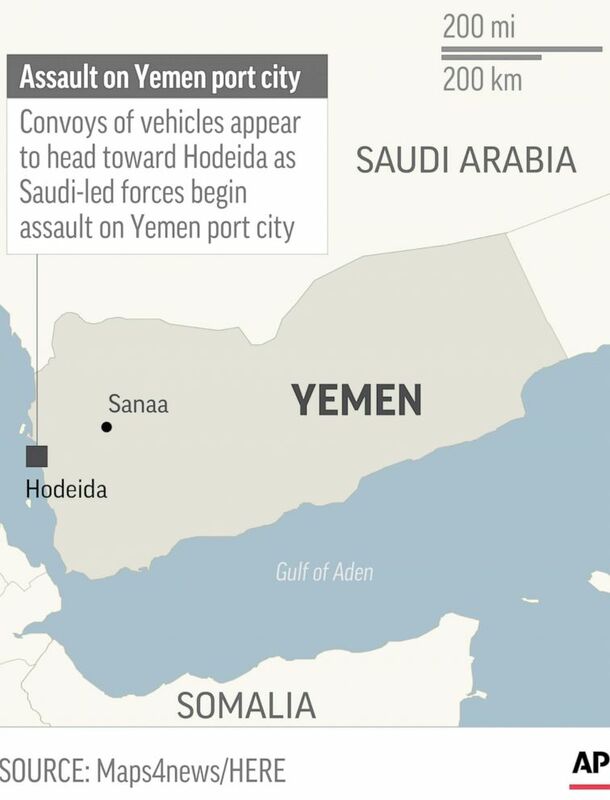 (AP) Map locates Hodeida, Yemen, where Saudi-led forces began assault. "Ninety percent of the food and fuel and the medicines that are consumed in Yemen are imported, 70 percent of them come through Hodeidah,” he said. "Seven million people are completely relying every month on food and more than seven million on other assistance, from humanitarian organizations." (Abduljabbar Zeyad/Reuters, FILE) A view of the Red Sea port city of Hodeidah, Yemen, May 10, 2017. Wednesday, the U.N. further warned that escalating violence in Yemen could lead to a refugee exodus as more people flee the famine and fighting. "It's actually surprising that an exodus has not happened yet," United Nations refugee chief Filippo Grandi told reporters in Geneva.